Below is a newly installed manhole cover of Wild Rice on Nicollet Mall, Minneapolis, MN. 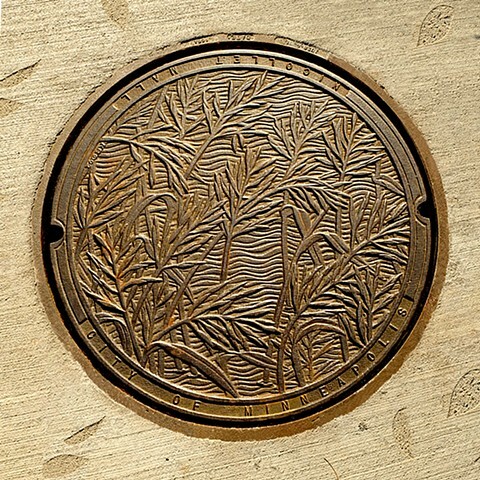 The Manhole Covers of Nicollet Mall is comprised of 75 covers with 11 unique designs each cast 7 times. A redesign by James Corner (architect of the High Line in NYC) of Nicollet Mall was just dedicated in November and included new concrete over 13 city blocks with etched leaf, branch and a basket weave designs. This is the new home of the manhole covers. From bronze bricks in Boston to artistic manhole covers in downtown Minneapolis, Kate Burke has a recognized career in both public art and painting, listed in the Smithsonian Archives of Painting and Sculpture. Predominantly a relief carver and painter, she has had commissions from the Minnesota State Arts Council and the Cities of Minneapolis and Boston working in cast iron, bronze and painted cast carvings. In painting, Burke has had her work recognized by Monsanto for her innovative use of Foam-Cor to create 3-dimensional landscapes. The overall result is dynamic and playful. NEW Nicollet Mall, Minneapolis, MN has undergone a redesign by James Corner designer of the High Line in NYC. The original manhole covers installed in 1992 have been removed, cleaned and reinstalled. A commemorative 28 page collection of all the cover designs complemented with rubbings and original drawings is available 8" X 8". Check out "booklets and prints"in Portfolio.